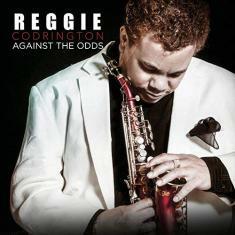 Urban-jazz saxophonist Reggie Codrington returns the favor with the first single from "Against The Odds"
FAYETTEVILLE (10 September 2018): Afflicted with Ataxic Cerebral Palsy that required nine major surgeries before he hit his teens, Reggie Codrington has a mother, Joyce Codrington, who used to exercise him four times a day. Now she is the one in pain and when her son learned that the antioxidants in cherries can help reduce pain and inflammation, he brought her some. It worked. She began to feel better and her discomfort eased. That's the inspiration behind "Cherry Sweet," the joyous first single from the urban-jazz saxophonist's "Against The Odds" album from M.A.N.D.A.T.E. Records. "My mother has done so much for me to help me become the person I am today. She always encouraged me and believed that I could live a full and productive life, achieving my dreams. My prayer is that this song will inspire people, that they can overcome setbacks and disabilities, and go onto achieve their goals in life when nurtured by love and encouragement," said Codrington, about the single being shipped to radio stations and going for adds on October 8. Known for commingling contemporary jazz, old-school soul and dancefloor funk, Codrington wrote "Cherry Sweet" for his eleventh album, which was produced by Robert "Bullet" Harris. The candied melody bungees off the springy electronic beats. Flittering like a butterfly, Codrington's free-form soprano sax improvs zip around gleefully, exploring the inner and outer edges of the rhythmic loop spiced up with a soulful vocal refrain from Harris and singer Pauline Harris. The least common type of the disorder, Ataxic Cerebral Palsy is a chronic condition that affects movement and muscle coordination with common symptoms that include tremors and difficulty walking. The son of trumpeter Ray Codrington, who accompanied Little Richard, Gladys Knight and Jackie Wilson, Reggie Codrington learned to read music when he was five, but ACP initially prevented him from playing sax. The surgeries involved muscles being cut and transferred from his elbow, wrist and triceps to improve the dexterity of his fingers. Muscles were sliced from his leg to enhance mobility, making it easier to walk. The gift of a curved soprano sax when he was 18 proved life altering, giving him a comfortable way to play his beloved horn. Codrington sought refuge from his disability in music, finding solace as well as a sense of belonging. "Something magical happened and I knew that I had found my niche. I fell in love," he recalled.